The great feast has arrived, a feast of great joy for Christians: The Holy Spirit has descended upon the apostles, and not only upon the apostles—the Holy Spirit has come to the world to fulfill the promise made to us by our Lord Jesus Christ when He said, “I will not leave you orphans, I will send the Holy Spirit, the Comforter.” And the Holy Spirit sanctified the Earth, and He will lead the Christian race on the path of salvation to the end of the ages. 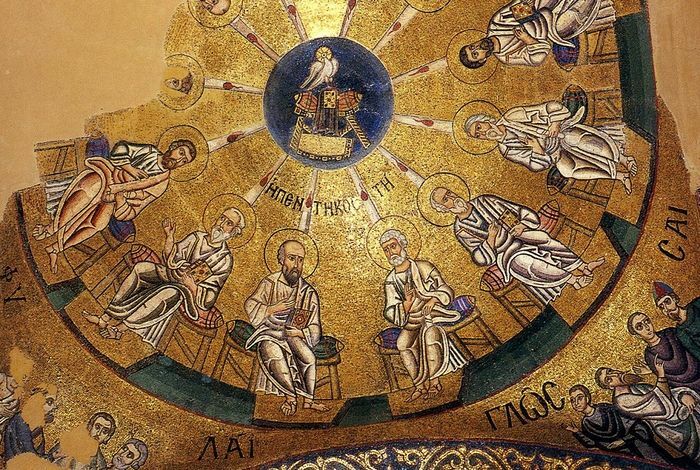 The Holy Spirit came down first of all upon the apostles. And how did He come down? In the form of fiery tongues, visibly. The Holy Spirit has not descended visibly like this upon anyone else since then. What does this mean? 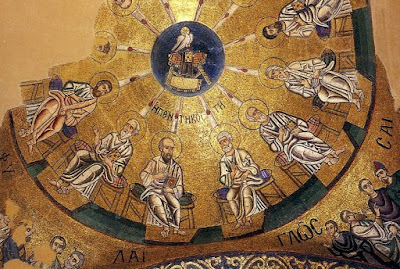 Why was it needed that the Holy Spirit should descend upon the holy apostles in the form of fiery tongues, visible and tangible to all? Because the apostles where saints; because through them, through their preaching, the Holy Gospel would be confirmed throughout the whole world. They were the first preachers of the Gospel, the first to bring the light of Christ into the world. This is why the Holy Spirit marked them in this way, descending upon them in the form of fiery tongues. He made their hearts and minds fiery, sanctified and enlightened them, reminded them of everything they had heard earlier from the Lord Jesus Christ, and gave them strength, so that they would bring the whole world to Christ. But doesn’t the Holy Spirit come down upon all who are worthy to receive Him? Wasn’t St. Seraphim of Sarov filled with the Holy Spirit? The Holy Spirit came down upon him not in the form of fiery tongues but in such a way that it took possession of all his thoughts, desires, feelings, and longings. He filled St. Seraphim. Thus did the Holy Spirit fill many, many saints, and thus did the Holy Spirit fill also all of us unworthy contemporary Christians, for in the Sacrament of Chrismation and Baptism we are all given the grace of the Holy Spirit. All are given this grace, all have received it, but not all have preserved it. Many have lost this treasure, lost the grace of the Holy Spirit. For could the Holy Spirit possibly abide in an impure heart that is filled with sin? As smoke chases away the bees, as stench repels all people, so does the stench of the human heart repel the Holy Spirit. The Holy Spirit lives only in pure hearts, and only to them does he grant He Divine grace, His holy gifts, for He is the “Treasury of good things”—all the true and most precious goods that the human heart could possibly possess. Could the impure heart receive them? Could the heart that is sinful and deprived of mercy and love possibly receive the grace of the Holy Spirit? But how can we acquire a pure heart? How can we refrain from shameful sins? How can we refrain from the temptations of the enemy of our salvation, from the temptations of the world? How can we guard ourselves from them? We need to tirelessly, always, throughout our days and every hour remember that the Holy Spirit does not live in an impure heart. We must not succumb to temptation, and when the unclean spirit, the enemy of our salvation whispers in our ear the longing for earthly prosperity, when he draws us a picture of a glorious, comfortable life, when he arouses our pride, a desire for honor and glory, we must not accept these devilish whisperings, we must not accept the temptations of the world. When these temptations come to the heart we should understand right away that this is a temptation. We should immediately, with all the strength of our minds and hearts reject these temptations, not look at the seductive pictures that the unclean spirit draws for us to tempt us; we should not succumb to his suggestions. And if we fail to do that, if we look at these picture of glory and earthly prosperity, if we think more and more about them, then woe to us—for then the temptation will take possession of our hearts. Great ascetics of piety, who knew how to observe the movements of their hearts, have said that if a person accepts these seductive images, he meshes with them; his soul becomes attached to them and unites with them. The holy fathers call upon us to fear uniting ourselves with all impure images. If we follow this instruction, we will not be stricken with that onerous and terrible woe—the Holy Spirit will not leave us. We must not admire, not delight in satan’s seductions, we should not mesh ourselves with them, but should arm ourselves against them with holy anger. The apostle Paul spoke profound words that we should all firmly remember: "Be angry, and sin not" (Eph. 4:26). There is holy anger—that anger with which Jesus’s heart was inflamed when He cast out the money-changers from the temple with a whip, and when He said to the holy apostle Peter, Get thee behind me, satan! How could the Lord Jesus Christ say such worlds to the holy apostle who loved Him with all his heart? He said it in anger. That is how it should be. The Lord could not but be angry with the apostle Peter when the latter was trying to persuade Him not to go to His death on the Cross. This is the holy anger that should be fill every Christian’s heart when he feels the whispered words against the path of Christ. Then may the Lord save us from remaining cold or lukewarm. May He give us holy anger to drive away the tempter. This is what we need. We need to also remember all our lives that the Lord Jesus Christ has called us to become God’s children, and to strive all our lives for the light of Christ. We must dedicate our whole lives to the Lord Jesus Christ. We must strive with every fiber of our souls to never anger the Lord in any way, and to pray that He would help us who are weak in spirit. And the Lord will help us. And the Holy Spirit will come to our hearts and illumine them, and give us the strength to walk the path of salvation. May the Holy Spirit come down into our hearts. May the Holy Spirit console us and all who sorrow. This is what this great feast of Pentecost teaches us.